Mary Ann Herr, 71, of Belleville, IL, born January 25, 1948, passed away peacefully at her residence in the comfort of her family and “second family” on April 1, 2019. To have met her once, you were her friend for life and knew you had met someone special. Any time you were with her after that, you realized you had been in the presence of an angel. 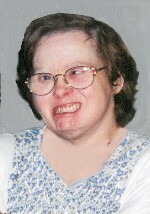 Mary Ann was born with Downs Syndrome at a time when little was known about this genetic disorder. It was said she was a special needs person, but her real and only need was love. She lived her life to the fullest and touched more lives than we ever knew. Mary Ann lived at home most of her life with her parents, five brothers and sister. It was an active and lively home and had a revolving door of family and friends. Mary Ann was in the middle of it all. She worked at S.A.V.E. for many years and developed great friendships. She participated in Special Olympics Bowling, took many trips, was a hard worker in her home’s kitchen, enjoyed sewing & needlepoint, all animals (especially puppies) and loved Mickey Mouse. For the past twenty-five years, Mary Ann lived at Flash Estates (formerly Belle Manor) in Belleville, IL. Here she thrived in a home that was filled with love and respect among staff and residents. We are forever grateful to the staff for the quality care they gave to her; far exceeding any expectations we may have had. The staff cared for her with sincere love, kindness and compassion and treated her as if she was one of their own. With the residents of Flash Estates and its associated homes, she developed true friendships, all of which became her ‘second family’. The staff and residents also became part of our family … we love you all and appreciate all you did for Mary Ann throughout her time and journey through life with you. Mary Ann was preceded in death by her parents, Bob and Irene, nee Deering, Herr; paternal grandparents, Joe and Emily Herr; maternal grandparents, Michael and Magdelene Deering; as well as uncles, aunts and cousins. Her dear aunt, Kay Deering; and nieces, nephews, great-nieces, and great-nephews, Alex Herr (wife Moe, and daughters Morgan and Audrey), Megan Sekman (husband Robert and children and step-child, Henry and Lillie and Sophia), Daniel Herr (wife Rebecca and children Grayson and Avery), Meredith Herr, Emily McKnight (husband Tim and children Tess and Bo), Rachael Herr, Marty Herr (wife Erin, and son Jackson), Charlie Herr, William Herr, Andy Herr (daughter Paisley), Abby Herr, Michael Herr, Torrey Herr (wife Sarah), Justin Schmidt and Austin Schmidt. We love you Mary Ann and always will. May God welcome you into His Kingdom and reunite you with all those family members and friends who have gone before you. In lieu of flowers, memorials may be made to the TDL Group with Flash Estates in the Memo section of the check. This donation will go directly to the activity fund of Flash Estates (Mary’s home), 225 West B Street, Belleville, IL, 62220, or to S.A.V.E. – St. Clair Associated Vocational Enterprises, Inc. – 3001 Save Road, Belleville, IL 62221, or to Family Hospice of Belleville – 5110 West Main St., Belleville, IL, 62226. Condolences may be expressed to the family online at www.rennerfh.com. Visitation: Friends may visit from 5:00 to 8:00 p.m. Monday, April 8, 2019, at George Renner & Sons Funeral Home, Belleville, IL, and from 9:30 to 10:30 a.m. Tuesday, April 9, 2019, at St. Peter’s Cathedral, Belleville, IL. Funeral: A Mass of Christian Burial will be held at 10:30 a.m. Tuesday, April 9, 2019, at St. Peter’s Cathedral, Belleville, IL, with Msgr. John Myler officiating. Private burial will be at Mount Carmel Catholic Cemetery, Belleville, IL. We have many memories of fun loving times with Mary Ann and the entire Herr family. She was a loving person and will be missed by everyone who knew her. Our prayers are with the Herr family during this difficult time. Mary Ann was a neighbor when I lived with my father on N. 44th St., Washington Park, Il., in the very early 1970’s. We became pals, and I spent time with her every morning on her front porch. I also remember her sweet Dachshund, Alfie. I was very young at that point in time, but I will never forget Mary Ann and how much our friendship meant to her and to me. My heartfelt condolences to the Herr family. Maggie was a very little tomboy at that time. Charlie, Pattie & family- So sorry to hear of Mary Ann's passing. I met her at one of Abby's BD parties years ago. She was so sweet n loving. May you all find comfort in your memories of her. Sorry for your loss, peace and comfort to the family.